When a friendly, extroverted cat suddenly becomes nervous and reactive, it is generally obvious to the owners that the cat is stressed. Stress may not be as easily detected in the shy, introverted cat who may be manifesting stress by sitting in a fixed posture, immobile for long periods of time. 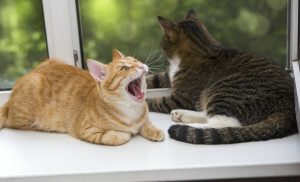 Cats handle stress in different ways depending on their personalities. 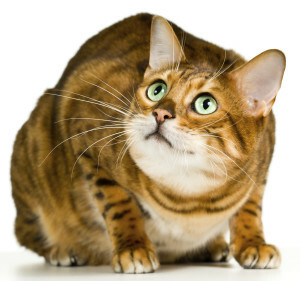 All of these behaviors can also be symptoms of illness, so it is important to take the cat to the veterinarian as soon as possible to rule out health problems as being the cause for the unusual behavior. 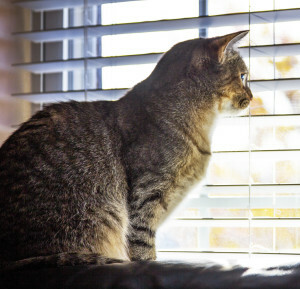 If the cat is experiencing territorial anxiety over the sight of cats, dogs, or wildlife outside, then the cat may spray windows, doors, drapes or prominent objects in the room where the windows are located. Blocking the cat’s view of the outside may help to eliminate these marking problems. When the cat urinates in front of the owner or on beds, furniture, or clothing, the message is clearly that the cat has a severe health problem, or that he is severely stressed by something in the environment. If he selects a particular person’s clothing or bedding for his toilet area, it generally means that this person is the source of his anxiety. It can be a positive or negative message. Most likely, the cat is exhibiting separation anxiety, or a status conflict. Having this person give the cat food treats as well as extra attention may solve the problem. It is also necessary to keep clothes and other previous targets away from the cat for awhile.